If you loved Erik X. Raj's Multiple Choice Articulation application, then you will like his latest application - I Dare You Articulation! Take all of the great parts from Multiple Choice Articulation - the narration, the fun, the motivational factors, the simplicity and cleanness of the application - and exponentially add more motivation/fun! What you get is I Dare You Articulation! Believe me and picture this - groups of third and fourth grade students coming into my classroom and expecting drill practice sit at the table to begin speech; during the session they are out of their seats, giggling, and motivated to move on to practice the next articulation sentence; after the session, students are all out of their seats begging me to play the application again! I kid you not, I have never seen my third and fourth graders so motivated and energized at 8:15 am to practice their articulation sounds! 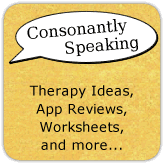 Continue reading to learn more about how to use this application to spice up your articulation therapy sessions! Similar to the Multiple Choice Articulation application, there are buttons for the /s/, /z/, /r/, /l/, /sh/, /ch/, and /th/ sounds. In addition, within each sound, you can decide between practicing the sound in the initial, medial, or final position of words or blends if applicable. There are around 600 dares total within the application for hours of practice and fun! The "i" button in the lower left hand corner will show information about the application and its use. Once you have chosen a particular sound, the application will show an "I dare you" sentence with 1-3 words which include the user's sound in the dare. 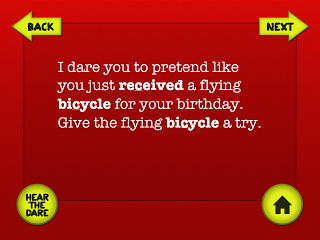 All of the dares are school/child appropriate and are similar to charades. The user can read the dare aloud or hear the dare read aloud by the narrator, Erik himself, by pressing "Hear the Dare" Press the "Back" or "Next" buttons to go back and forth between dares. To choose a new sound or position within a word, press the home button. This application has children practicing speech sounds at the sentence level, but in a fun, motivating way! 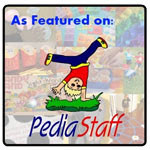 The sounds available on the application are the ones that speech-language pathologists work on the most with students. The dares are fun and appropriate which makes the application motivating in the fact that you look forward to seeing what kinds of crazy dares are coming up. My students would act out a dare, then return to the table every time! They would wait in anticipation and sometimes even raise their hand to offer to do a dare! Dares can be read aloud by the narrator which helps not only with auditory bombardment but for students in a group who may need an auditory cue or have difficulty reading. It is easy to use both by SLPs and students alike. Also, the application is clean with no distractors. Erik X. Raj is great at creating complements to his applications whether in blog posts, videos, or as PDF activities to print. Erik created 30 flashcards that can be printed, cut out, and laminated to use along with this application or to send home. Access the file via his blog post or via the file linked here. I am a big fan of user profiles and data tracking for students. Even a plus or minus button would be great to monitor a child's speech without having to write on a separate piece of paper. I would like to see the ability for a user to play multiple sounds at a time. I have students who are in the carryover phase of more than one sound or students working on different sounds in a group, so this would allow me to focus on more than one sound without having to switch between them. It would be great to be able to record student response audio so that you can evaluate student progress in elicited speech and the student can self-assess his or her own speech. As I said with the other application, I would love to see more sounds on this application such as /k/, /g/, /f/, /v/, and /dg/! It might be nice to have silly visuals along with the questions for those who have difficulty visualizing different concepts within questions. That and it would definitely be more motivating and fun! Articulation - The main focus of this application is articulation. Have students read dares to each other which elicit specific sounds. Voice/Fluency - Have students read the dares on the application and answer them using vocal/fluency strategies. Many of the dares require students to use different character-like voices. Expressive Language - Students can practice daring each other and creating their own dares (make sure they are appropriate). Receptive Language - Have students give definitions of the words in bold. They can also describe what the different words would look like, feel like, etc. Following Directions - See if the student can perform the direction(s) of the dare when they are stated aloud. Pragmatic Language - Students can take turns daring each other. Talk about how each person should have a chance to dare and be dared. Talk about what it feels like to be dared and how it is okay to say no to a dare. Gross Motor - Many of the dares require the student to get up out of his or her seat to do which require gross motor skills. Prior to using this application, consider the gross motor skills of the student(s) you will be using it with. 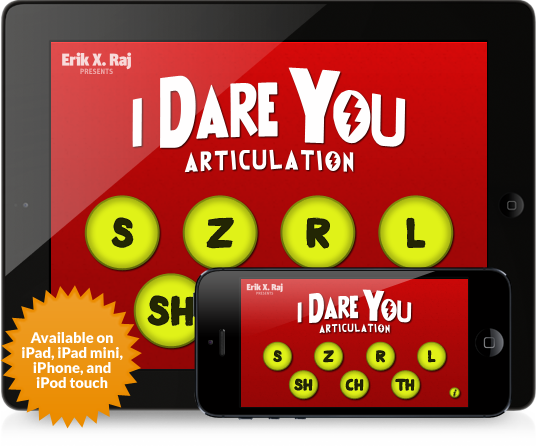 I Dare You Articulation is available for the iPod and iPad for $4.99. Don't forget to vote for this application on Yapp Guru! The author of Consonantly Speaking was given a copy of the application to review. No other form of compensation was received.